Waterfowl are certain wildfowl of the order Anseriformes, especially members of the family Anatidae, which includes ducks, geese, and swans. Some definitions of the term 'waterfowl' include the saltwater shorebirds or waders, gulls, pelicans, and herons, as well as seabirds such as the albatross, but 'fowl' especially refers to birds used by humans for game. They have historically been an important food source, and continue to be hunted as game, or raised as poultry for meat and eggs and are sometimes kept as pets. They are strong swimmers with medium to large bodies with webbed feet and a broad, flat, and somewhat rounded-tip bill. Some species dive deep for fishes or mollusks, others feed near the surface or filter through shallow bottom sediments. Some even graze on land. Most species of waterfowl are migratory. The fossil of the bird Presbyornis shows a long-legged shorebird-like form with a duck-like bill. This fossil, which is some 50 million years old, so good may suggest an evolutionary relationship between Anseriformes and shorebirds. The mallard is one of the most recognized of all ducks and is the ancestor of several domestic breeds. Its wide range has given rise to several distinct populations. 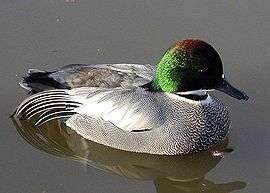 The male mallard's white neck-ring separates the green head from the chestnut-brown chest, contrasts with the gray sides, brownish back, black rump and black upper- and under-tail coverts. The speculum is violet-blue bordered by black and white, and the outer tail feathers are white. The bill is yellow to yellowish green and the legs and feet are coral-red. The female mallard is a mottled brownish color and has a violet speculum bordered by black and white. The crown of the head is dark brown with a dark brown stripe running through the eye. The remainder of the head is lighter brown than the upper body. The bill is orange splotched with brown, and the legs and feet are orange. Male canvasbacks have a chestnut-red head and neck, a black breast, grayish back, black rump and blackish-brown tail. The sides, flank and belly are white, while the wing coverts are grayish and vermiculated with black. The bill is blackish and the legs and feet are bluish gray. The iris is bright red in the spring, but duller in the winter. Female canvasbacks have a light brown head and neck, grading into a darker brown chest and foreback. The sides, flanks and back are grayish brown. The bill is blackish and the legs and feet are bluish gray. Both sexes of Canada geese have a black head and neck except for broad white cheek patches extending from the throat to the rear of the eye. The female of a breeding pair is often smaller. The breast, abdomen and flanks range in coloring from a light gray to a dark chocolate brown, either blending into the black neck or being separated from it by a white collar. The back and scapulars are darker brown, the rump is blackish and the tail is blackish brown with a U-shaped white band on the rump. The bill, legs and feet are black. Most subspecies are uniformly large and pale and exhibit the characteristic "honking" call. There are 7 recognized subspecies of Canada geese: Atlantic, Hudson Bay or Interior, Giant, Moffitt's or Great Basin, Lesser, Dusky and Vancouver. In general, the subspecies nesting farther north are smaller in size and darker in color to the west. The Giant Canada goose is the largest goose in the world, with some individuals weighing more than 20 pounds. They can also be long-lived, with a banded giant Canada goose at 30 years and 4 months currently holding the longevity record for waterfowl. The Mute swan originating in Eurasia, is an invasive species to North America. The species is very large with all white plumage and long necks. They are identifiable from other swans by black knobs at the base of their beaks. Mute swans have black feet and orange beaks. Juveniles can range from the typical white plumage to a grayish-brown plumage. The grayish brown can also apply to their bill and feet while juveniles. Regardless of age, the Mute Swan is a very aggressive species and will attack native waterfowl as well as species as large as humans. ↑ "Mallard: Waterfowl ID". www.ducks.org. Retrieved 2016-10-09. ↑ "Canvasback: Waterfowl ID". www.ducks.org. Retrieved 2016-10-09. ↑ "Canada Goose: Waterfowl ID". www.ducks.org. Retrieved 2016-10-09. ↑ "Mute Swan: Waterfowl ID". www.ducks.org. Retrieved 2016-10-09. Look up waterfowl in Wiktionary, the free dictionary.